Countries in Asia Pacific have witnessed a massive change in their respective healthcare infrastructures and number of resources trained in the use of technologically advanced medical devices in the past few years, leading to the vast rise in the usage of advanced endoscopy devices. The rising geriatric population, rising disposable incomes, increased healthcare infrastructure, and an increased awareness regarding the benefits of minimally invasive devices has also accelerated demand for endoscopy devices in Asia Pacific in the recent past. Transparency Market Research estimates that the market will tread along a healthy growth path and exhibit a 7.6% CAGR from 2016 through 2024. The market, which had a valuation of US$7.76 bn in 2015, is expected to rise to US$14.8 bn by 2024. 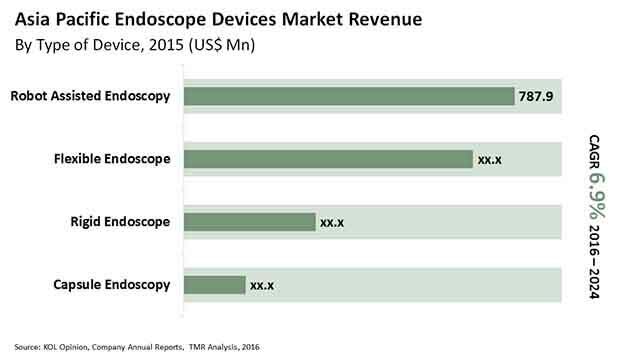 A variety of endoscopes, endoscopic operating devices, and visualization systems required for endoscopy procedures come under the purview of the endoscopy devices market. Of these, the segment of visualization systems presently leads the Asia Pacific endoscopy devices market in terms of revenue, accounting for over 46% of the market’s overall revenues in 2015. Factors such as strengthening economies, rising population of affluent patients, and rising expenditure on health and wellness have enabled the increased adoption of costly and technologically advanced endoscopy visualization products across healthcare settings in the region in the past few years. The segment is expected to expand at an excellent pace over the forecasting horizon as well, retaining its dominant stance across key product varieties. Of the key types of endoscopy visualization systems available in the Asia Pacific endoscopy devices market, the segment of high definition (HD) visualization systems is the leading product variety. The segment accounted for nearly 73% of the overall endoscopy visualization systems market in Asia Pacific in 2015. Collectively, gastrointestinal, cardiovascular, and arthroscopy surgeries accounted for the leading share in the Asia Pacific endoscopy devices market in 2015. On an individual level, however, the segment of laparoscopy surgeries leads in terms of revenue in the Asia Pacific endoscopy devices market. The segment accounted for a 33% share in the overall market in 2015. The vast rise in the number of surgeries such as hernia repairs, antireflux, cholecystectomy, and appendectomy and the emphasis on noninvasive surgical procedures are key to the high contribution of laparoscopy surgeries to the market’s revenues. Expanding at a 9.1% CAGR, the laparoscopy surgeries segment is expected to remain one of the leading individual contributors to the market’s revenues from 2016 through 2024 as well. Japan was a key revenue contributor to the Asia Pacific endoscopy devices market in 2015, accounting for a more than 35% of revenue. High disposable incomes, rapidly rising geriatric population, and increased adoption of minimally invasive devices were the key forces driving the endoscopy devices market in Japan in the past few years. However, the mature market is expected to witness stagnant growth in the near future and lose its prominence to countries such as India and China. The market for endoscopy devices is expected to witness expansion at a strong pace in China, at an estimated CAGR of 9.9% over the period between 2016 and 2024, among the most prominent countrywide markets for endoscopy devices in Asia Pacific. The China endoscopy devices market is expected to rise to a valuation of US$5.58 bn by 2024. Some of the leading vendors in the highly fragmented market are Boston Scientific Corporation, Ethicon Endo-Surgery, Inc., Arthrex, Inc., Fujifilm Holdings Corporation, Intuitive Surgical, Inc., Cook Medical, Inc., KARL STORZ GmbH & Co. KG, HOYA Corporation, Stryker Corporation, Olympus Corporation, Medtronic plc, and Smith & Nephew plc. The endoscopy devices market in Asia Pacific has been classified based on type of device, application, and geography (countries). Major device types include endoscopes, endoscopic operative devices, and visualization systems. Furthermore, endoscope devices include rigid endoscope, flexible endoscope, capsule endoscope, and robot-assisted endoscope. Endoscopic operative devices include energy systems, suction/irrigation systems, access devices, and operative hand instruments. Visualization systems include endoscopic ultrasound devices, standard definition (SD) visualization system, and high definition (HD) visualization systems. Based on application, the endoscopy devices market has been segmented into urology/gynecology surgeries, ENT surgeries, neuro/spinal surgeries, laparoscopy surgeries, and others. The market for these segments has been extensively analyzed based on their utility, effectiveness, sales, and country presence. Market revenue in terms of US$ Mn for the period from 2014 to 2024 along with the compound annual growth rate (CAGR %) from 2016 to 2024 are provided for all segments, considering 2015 as the base year. In terms of geography, the report has been segmented into Australia, China, India, Japan, South Korea, New Zealand, Singapore, and Rest of Asia Pacific. Market revenue in terms of US$ Mn for the period from 2014 to 2024 along with CAGR % from 2016 to 2024 are provided for all the key countries considering 2015 as the base year.